Usually held the later part of September. 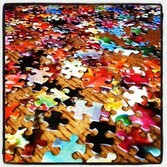 ​The Friends of BPL Annual Used Jigsaw Puzzle Sale is a favorite with puzzle lovers. It's an easy to browse sale where puzzle lovers can shop for a wide variety of good quality puzzles at great suggested donation prices. The sale is held in September each year at the Mills Community House. Credit cards accepted. We also keep a selection of puzzles available in our Ongoing Sale at the BPL. ​Donations of puzzles in excellent condition (clean with ALL pieces) are accepted year round. Excellent condition means something ​you’d be proud to give to a friend.